Plutonium, as with other members of the actinide series, is highly radioactive. Plutonium differentiates itself from the rest of the group by being one of only three primary fissile isotopes in use (239Pu) – [the other two include 233U and 235U] – to produce and sustain a nuclear chain reaction when struck by a slow moving neutron. In fact, just one kilogram of 239Pu can produce an explosion equivalent to 21,000 tons of chemical explosives. Its primary applications include weapons and power or fuel generation, and its applicability is determined by the fractional amount of spontaneously fissile 240Pu contained in the system. Weapons-grade plutonium has the smallest amount of 240Pu dillution (<7%), while power-grade plutonium has the largest amount of 240Pu present (>19%). Additionally, other isotopes have been used for very specific applications: 238Pu is used in radioisotope thermoelectric generators on deep-space spacecraft, and 233Pu was used for power systems on lunar equipment set in place during the Apollo program. The choice of which particular plutonium isotope to use is determined by application requirements and half-life characteristics of the isotope. Plutonium’s most stable isotope (244Pu) has a half-life around 80 million years – long enough for trace amounts (parts-per-trillion) to remain present in the Earth’s crust. Discovery of plutonium in the laboratory was necessitated by the scarce amount of this element available in nature. First falsely discovered by Enrico Fermi in 1934, plutonium was first synthesized by Glenn Seaborg (under Edwin McMillan’s leadership) at Berkeley Radiation Laboratory in 1940 through deuteron bombardment of uranium. The official discovery was predicated upon uranium research that Egon Bretscher and Norman Feather had experimented upon at the Cavendish Laboratory in Cambridge. While the discovery and first synthesization was complete in 1940, the fact of plutonium’s existence was not known publicly until 1946 – after conclusion of the primary motivation for the Manhattan Project. The United States’ very first atomic weapon test (“Trinity”) as well as the second atomic bomb dropped on Japan (“Fat Man” – Nagasaki), used plutonium as its fissile material. The Nuclear Test Ban Treaty was set in place partly due to concerns over worldwide plutonium contamination. Plutonium is a silvery-gray metal and oxidizes readily when exposed to air. When exposed to moist air, the volume of the plutonium sample can increase 70%, causing powder to flake off and spontaneously ignite. Other atypical observations of plutonium include its increased density when it melts and its resistivity increases when its temperature is lowered – both unusual traits of metals. Plutonium’s complicated phase diagram also makes machining plutonium difficult as its states easily change through several allotropes depending on its environmental conditions. Due to its reactive nature, plutonium combines with many other elements to form compounds and metal alloys, none of which have any applicability outside of fundamental scientific research Plutonium has twenty known isotopes, many with applications described earlier. Over time, plutonium isotopes = 244 typically decays into uranium and neptunium via alpha decay. Isotopes >244 typically decay into americium through beta decay. Plutonium is a Block F, Group 3, Period 7 element. The number of electrons in each of Plutonium's shells is 2, 8, 18, 32, 24, 8, 2 and its electronic configuration is [Rn] 5f6 7s2. In its elemental form, CAS 7440-07-5, plutonium has a silvery white appearance. 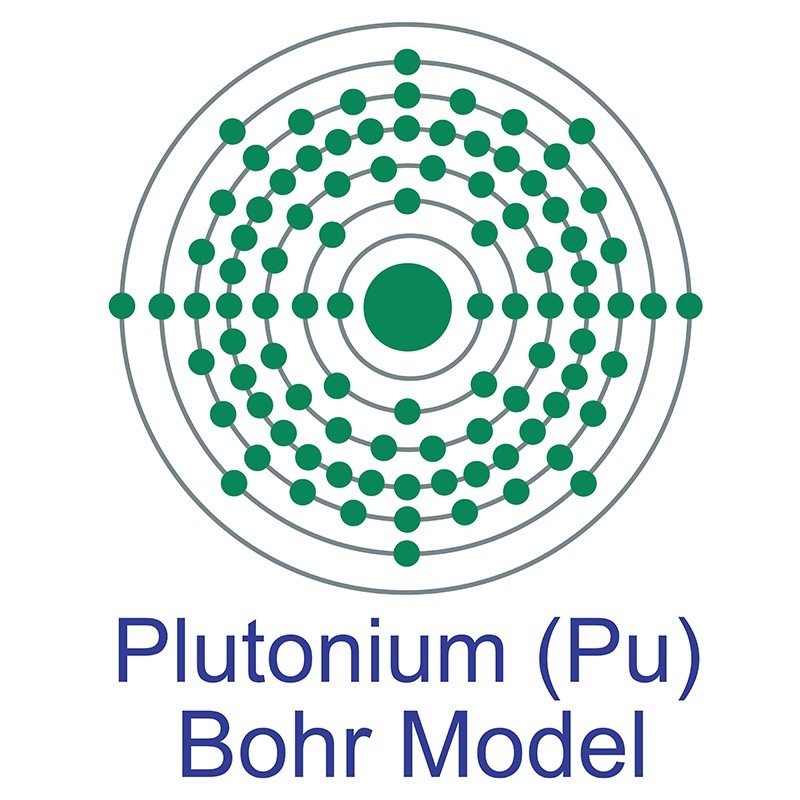 The plutonium atom has a radius of 151.3.pm and its Van der Waals radius is 200.pm. Plutonium is found in some concentrated ores of uranium. Plutonium was discovered by Glenn T. Seaborg, Edwin M. McMillan, J. W. Kennedy and A. C. Wahl in 1940. The element Plutonium was named after the former planet Pluto. Plutonium is radioactive and toxic. Plutonium information, including technical data, safety data and itsproperties, research, applications and other useful facts are discussed below. Scientific facts such as the atomic structure, ionization energy, abundance on Earth, conductivity and thermal properties are included. Plutonium is an artificial element. It has no stable isotopes.